Screw Mounts | Cable Tie Screw Mounts | Cal Fasteners, Inc.
Cal Fasteners offers screw mounts that are engineered to provide maximum support for larger wire and cable bundles and tubing. The deep cradle design ensure secure support in any application. Deeply recessed screw holes allow cable ties to pass over the screw head without catching for easy installation. Screw mounts are available in a variety of lengths, heights, and widths to meet your needs. Available in natural and black. ROHS compliant. For mounting in confined spaces, we also offer low profile screw mounts. 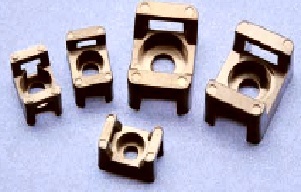 Request a quote on the screw mounts you need, or contact Cal Fasteners to learn more.